Quite a busy week has past me by, and I am keenly looking forward to the weekend. It is another big clash for us, in what has been a tough start for us on paper. The game in midweek against Coventry kept us all buzzing, and the 6-1 win with what is our reserve side, is a pretty good result. Olivier Giroud got the monkey off his back by scoring his first goal in an Arsenal shirt, and there were impressive displays all around. Arshavin provided a couple of assists, and scored a goal himself, Chamberlain scored a screamer, and Miquel too put in a good defensive display. And there were returns to the first team for experienced players like Johan Djourou, Theo Walcott and Andre Santos, as well, which goes to show some great strength in depth. Arsene Wenger will be pretty pleased with the team’s display and praised Giroud for his display. It was in everybody’s mind that the sooner he gets it the better,Certainly in his mind much more than in others’ minds. That is positive of course. It was a good finisher and he is a good finisher, Olivier.At the moment I believe he is looking for confidence again and that goal will help him. I expect him to take that confidence into the Premier League. The French international himself thanked the Arsenal fans, for helping him in the past few weeks. The supporters were behind us and behind me,There were 60,000 spectators for a League Cup match. I find that extraordinary. It’s not like that in every stadium.This goal has taken the pressure off me. It’s done, I have my first goal. But it has to be the start of a beautiful adventure,Even unconsciously I was thinking about this first goal. I tried not to think about it but my family, friends and a lot of people were talking to me about it.For a striker, it’s always good to find the net again. I have an assist already this season but it’s not like a goal. For a striker, it’s important for the confidence. I hope many more will follow.The start of the season has been very positive – we need to build on that,I feel the players are serene. We’re not getting carried away, we know it’s just the start of the season and everything goes very quick in football.We are still unbeaten and it’s very good. We are not conceding many goals and we score a lot so it’s very good.We will face a big team on Saturday, Chelsea, after a very good performance at Man City. It will be interesting to see how the team copes. He also spoke about the situation of Walcott, who played more centrally in the second half, scoring twice. I am not against it, not at all. We will try. At the moment we have a big competition up front, we have a different formula and the team is doing well. His time will come for that and at the moment we have to be a bit patient. He is a great finisher now, Walcott, in front of goal he is absolutely amazing. Johan Djourou, now firmly fourth in the pecking order of central defenders at the club, got his first start of the season against Coventry. People have forgotten that I am not a right-back. I took a lot of criticism last year for that, because I was playing out of position.When you play there for as long as I did last season people assume it IS your position. But it’s not. So, for me, it was a difficult season last year.As a player, I didn’t complain about being right-back because I am a team player – I would do anything for my team, for my manager and for my club. Steve is a great coach and, to be honest, I believe we can achieve some big things with our manager and with him. He [Bould] was my first manager in the U-15s and U-17s and I have always had a great respect for him.Pat Rice was great, but because of the way Steve played the game, it’s just a massive positive for us.Steve works on team shape. With Arsenal, people have always blamed the defence for our problems, which I have always felt has been pretty harsh.With Steve joining Mr Wenger, it is not only the defence that protects the team – it starts from the front.Our midfielders, Mikel Arteta and Abou Diaby, have been doing a great job protecting the defence and that’s what you need at this level.The guys are also working hard up front. Now it is the whole team that defends. There is a massive difference now to what we had before. Apart from the playing field, there have been some major developments as well, elsewhere in the club. First, Arsenal have confirmed an overhaul of the the existing youth academy. Looking ahead, the Club is in the process of agreeing the necessary planning consents for a major development of its youth development training facility at Hale End. And the club also revealed profits to the tune of £36.6 million for the financial year, when the latest reports were released. And of course, we had the usual rambling from Gazidis about the club being in a healthy state, financially, blah blah, 15 years Champions League, blah blah, UEFA financial fair play compliance, blah blah, success over the long term, increased revenues, blah blah, operating profits, blah blah, Highbury Square development project, blah blah, profit from player trading, blah blah blah. So, I am pretty sure it was a copy of the speech used last time, with just a few number crunches here and there. You can of course get the entire excerpt on the official site. And as usual is with the remaining blah blahs, Gazidis also reaffirmed that Wenger had the cash to spend on new signings. And of course, I will try to delve into the financials of the club in the coming days. In other new, Andre Santos has been given a 12 month ban on driving his black Maserati, after he was found guilty of racing in London at 145 mph. Damn, I can’t call dibs, but I would love to drive the cuddly Brazilian around, if he wanted me to. Anyways, as the Maserati picks up some rust, Londoners can walk safely on the streets again. Carl Jenkinson could very well soon be rewarded for his fantastic start to the season, with an international call up for the England national side, if recent rumours are to be believed. The right back, who is also eligible to play for Finland, will, however have some tough competition, with Glen Johnson, Kyle Walker and Micah Richards all in contention. Growing up as an Arsenal supporter, he looks like he could be a potential first teamer in the future. He recently dedicated a stone in Armoury Square, with the words “Granddad, hope you are watching – Carl Jenkinson” in memory of his grandfather who was an avid Gooner. Ah, something about the game then. Chelsea, the European champions, arrive at the Emirates, with a completely different squad from the one that beat Bayern Munich in the final of the Champions League, almost 5 months earlier. Didier Drogba, Jose Bosingwa, Salomon Kalou, Raul Meireles have all left, and the club has invested a huge amount in bringing a talented young bunch of exciting players in. None bigger than their marquee signing, from Lille, in Belgian attacking midfielder Eden Hazard for a meagre £32 million. Also coming in was highly promising German international midfielder Marko Marin from Werder Bremen for £7 million, Brazilian international wonderkid Oscar from Internacional for the cheap at £25 million, Cesar Azpilicu-something from Marseille for £7 million, Victor Moses from Wigan for £9 million, and the younger brother of Eden Hazrd for a relative penury of £0.5 million from Lens. It finally looks like Chelsea want to move away from their old unattractive, rather defensive style of play into a more expansive talented side. Under Mourinho, Chelsea eked out wins like no other team in the league. When they had the lead, they were very hard to break down to. And that has been the philosophy for quite a while now. However, Chelsea fans will argue, that on one season under Carlo Ancelotti, in 2009/2010, they thumped over 100 goals, which stands as the league record. Chelsea were quite simply happy to park a bus in front of the goal, as they won the Champions League, in the process beating Benfica, Barcelona and Bayern. But, Abrahamovich clearly wants to see some flair, and has gone gung ho about getting the creativity he wants to see. Eden Hazard already has already had a bright start to life in the English Premier League, scoring once and providing 6 assists in the 5 league games he has played. And, I expect Chelsea to start with the duo of Hazard and Mata tomorrow. The Arsenal defence, will have their hands full, with such a brilliant array of talent in front of them. Speaking of which, Juan Mata, has been impressive himself, assisting thrice and scoring once. He was snatched from right under our noses, but Arsenal have got their own little Spanish prodigy now, in the form of Santi Cazorla, whose vision, awareness and trickery has delighted fans. He has been the attacking mastermind, with his 3 assists and one goal. The other two Spaniards who will be playing tomorrow are Mikel Arteta and Fernando Torres. Arteta has come to the defence of his old pal, with whom he was neighbors, when the duo were in Everton and Liverpool respectively. I don’t like the way he has been treated because I have known him since we were 16, 17 and I really appreciate him. He is a friend of mine. Obviously, football is like that – it doesn’t matter what you have done in the past, it is only what you have done in the last few weeks.He has been criticised. Mentally he is a really strong guy even if someone doubts him.When you play as a striker and they pay £50million for you, you are under huge pressure,And obviously when the ball isn’t going in the net, it is even more difficult because people always look at that.For a striker, sometimes it is not fair. For a midfielder or a defender it is a bit easier to adapt. For a striker it is tough. While Torres has not really hit top gear in terms of scoring goals, it would be fair to say that the striker’s overall gameplay has improved. Far too often accused of just being able to score goals, and do nothing else, the Chelsea striker has shown immense work rate, which has gone rather unnoticed. He will still be a tricky customer. Unfortunately, for Chelsea, they do not have much backup upfront, after the departures of Didier Drogba and Nicolas Anelka to China. The Gunners would especially be happy to see that Drogba is not on the scoresheet. When the Chelsea striker played, he was always a scourge to the defenders, with his physical approach and ability to hold the ball. The Gunners failed to win a single game, out of 22, losing 13 in the process, when he played, which is pretty poor. Good riddance. Meanwhile, Chelsea captain John Terry was handed a 4 match ban for his racist abuse directed towards QPR’s Anton Ferdinand. The England international, often prone to high profile slip ups during games, lack of handshakes, and shagging on friend’s wives, will be available for selection though, as he still has the right to appeal the ban. Arsenal team news then. Thomas Vermaelen will be available for selection, himself, and is expected to go right back into the first team, despite the bossy performance of Laurent Koscielny last week. However, there are some murmurs that Koscielny could be handed a start, which means you may have a hard time, if you sitting right behind the Arsenal dugout tomorrow, with Mertesacker being benched. This could be particularly because of the pace that Chelsea possess now, with Hazard, Mata and Ramires, and playing Koscielny could serve is better. Jack Wilshere has returned to full training, but won’t be available for selection as of yet. He will be given a run out against West Brom in the reserves. Bacary Sagna also returned to training, and is a week away from being available, while Rosicky and Szczesny are atleast 2 weeks away. Last week, Aaron Ramsey was selected to play in midfield, and it suited the team really well, giving us lot of balance, but I would expect Wenger to opt for such a formation only for tough away games, and not a home game, where we should really be having a go at the opposition, instead of just winning the battles in midfield. That said, I wouldn’t be surprised if Theo Walcott was handed a start, especially considering his fine form against Chelsea in the past, and with Gervinho misfiring last week. I can also see Giroud being named, and that will give us some more options up front. 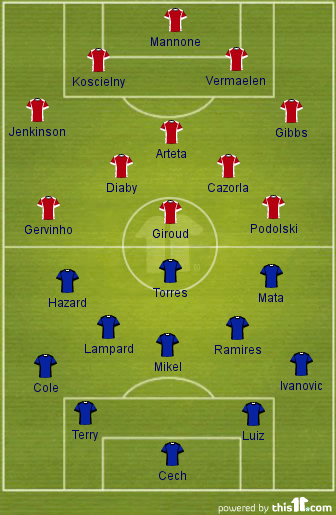 Here is how I expect the teams to line up, though. I feel Arsenal should be able to exploit Chelsea’s weak point, and that is Mikel, who at times doesn’t look the part for me. This should be able to give us enough room to govern the midfield, and hence dictate play. What Chelsea have been able to do is, break very quickly, given the pace they have. Ramires vs Diaby will be interesting to watch. The Brazilian has a fine engine. Carl Jenkinson has had it going his way so far, but Eden Hazard is a completely different prospect from playing an inexperienced Raheem Sterling, or a Scott Sinclair. And the same goes for Kieran Gibbs as well. The defence will have to be at their very best again. Championship wins are always based on solid home form, and Arsenal will do well to win 3 points tomorrow, to move ourselves within a point of Chelsea, albeit having played some tough games, against Stoke, Liverpool and Manchester City, all away. On paper, Chelsea have had an easier start, having faced Wigan, QPR away and Reading, Stoke at home. But, form and reputations do not matter. What matters is performance. Will the Gunners show the Blues who is top dog in London, or will the Blues build on their lucky Champions League win to return home with the spoils? Sure is an interesting prospect! Roll on the Blues (roars)! If you love statistics, defending and Arsenal, you are bound to love this article. Using some statistics, and some thinking, I try to determine Arsenal’s best central defensive pairing.